WingerBLOG: 20120506 - J Approves! 20120506 - Up in the am and L ran to pick up D from his overnight bday party. We headed to church for Sunday school. After church we stopped at the Home Depot to get a couple supplies and ran into some friends that didn't have room in there car for one of the three toilets they got, so we put it in our ginormous car and delivered it. Home and started building. 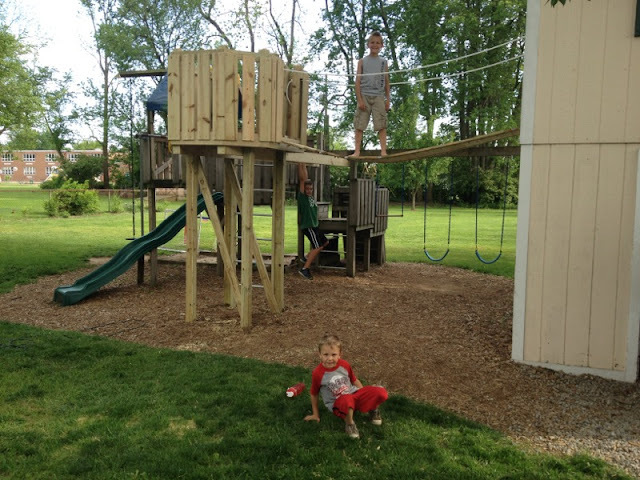 Soon a couple guys showed up and we stared the last work on the playset. L&J headed to J's football game and D mowed while we knocked out the rest of the build and got things cleaned up. L got home an Gma&paW after J's game. He had a great game and they won again. He said he got to carry the ball 3 times and pulled 7 flags! I think we have found his sport :-) J came out to see the finished playset addition and really liked it and appreciated it, I could see it on his face. I took a moment with his as everyone else went to the house to eat and told him that I was happy to do it for him and that some day, when his little boy wanted a huge playset, no matter how busy or tired he was, he needed to stop and take the time to do it, because that is what we do for the people we love. Soon the Cole's stopped by with food and we ate. Everyone left and L took the boys swimming at Gma&paB's hotel, GpaB is getting his other knee replaced tomorrow. I stayed home and clears up the tools and garage. The fam made it home before I was done, but I finished up in time to tuck them in.